To get to know the man better, here's a rare interview he gave Frets Magazine in 1985. There's also a tab of "Ain't Misbeheaving" in it. 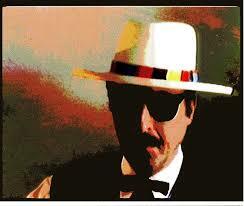 All these songs have been recorded by Leon Redbone and you can find his performances on YouTube. All the lyrics are provided and written under the tab for easy learning (except for "Why"). 25 pages of tab and 180 minutes of lessonvideo's. Leon Redbone played this Lonnie Johnson song often as there are at least 4 versions on YouTube. It's one of the few songs in which he desplayed his guitar prowess, sometimes a bit quircky but always interesting. My version is heavely based on these YouTube versions. Another one of his favorite songs. My version is based on his 1977 YouTube performance; one of the few he plays alone. The guitararrangement is pretty basic, apart from the solo at the end, which is challenging. Pianist Jelly Roll Morton recorded this song at the end of his career in 1939. It's one of the first songs he also sang and he turned out to be a great bluesy singer. Leon was heavely influenced by Jelly Roll's singing and it shows in this song especially. For the guitararrangement I wanted to step away from the simple comping style Leon uses on this song and I borrowed much of Dave van Ronk's arrangement, although the vocals are more Jelly's and Leon's. One of Leon's own compositions and a great take on the old style Tin Pan Alley blues. The accompaniment behind the vocals is kept very simple but has a few unusual steps. I made my own interpretation of the accompaniment between the verses. One of his most original arrangements of this Irving Berlin songs and really fun to play. This song is carried by its great lyrics so I kept the guitararrangement simple. Again I wanted to step away from Leon's simple comping style and used much of Duck Baker's arrangement. Probably the most difficult song in this set. Another great Jelly Roll Morton song in which Leon's singing really shines. The guitararrangement is more based on Jelly's singing as Leon comps this very simple on his recording.